-- Kayte Deioma, About.com travel writer. Read Kayte's complete review in this RideMax for Disneyland article. "Thanks RideMax! My 4 year old daughter was able to experience Disneyland the way I remember it from my youth." "Amazing!! I will NEVER try to do Disneyland again without Ridemax." With all of the great Disneyland-related guidebooks and websites out there, you might be asking yourself, "Why do I need RideMax for Disneyland?" You select the attractions. You select the date. You even tell the software the time of day you wish to begin and end your visit, and when you want to "break" for meals and shows. Did you know that a Disneyland plan that works well on a Wednesday might not work nearly so well on a Tuesday? Or that a plan that works well in the summer may be a disaster during the holidays? For these reasons, each time you create a plan with RideMax you select the exact date of your visit. RideMax will then download and use our latest estimates for that specific date when it creates your plan! Why spend weeks or even months in online discussion groups carefully mapping out your own custom "game plans?" RideMax can do this for you in a matter of minutes. Many of our customers buy the software the day before their trip -- and get great results! 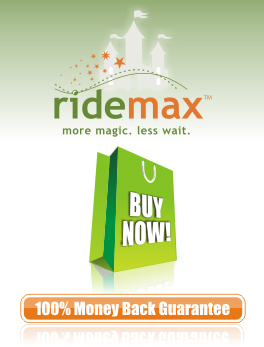 RideMax includes our wait time estimate for each attraction in your plan. While we don't expect these to be perfect, it's something a guidebook doesn't offer. And these estimates allow you to adjust your plan, perhaps by adding or removing attractions, until you arrive at TOTAL estimated wait with which you're happy! Ride your favorite attractions more than once. Most "one-size-fits-all" itineraries only include one ride for each attraction in the itinerary. With RideMax, you can plan to ride your favorites multiple times! Why burden yourself wading through information and advice for Disneyland attractions you have no intention of riding? RideMax plans are very succinct. Each plan includes time-saving tips for the date of your visit and your specific list of attractions. RideMax surfaces the essential information you need -- not all the fluff you'll forget! You aren't limited to creating just one or a few Disneyland plans with RideMax. Create as many itineraries for Disneyland or California Adventure as you wish during your subscription period. Get current itineraries from Disneyland experts. RideMax is not a "sideline" business -- it's our full time job. This allows us to focus our efforts on the software and on staying current with the many changes Disney likes to make. When a new attraction comes online, you can bet that it will be included in RideMax just as soon as we can observe the wait patterns -- normally within days or even hours of its opening! With all of these advantages, why not download RideMax now and start planning your Disneyland vacation today?! !